In no particular order I present the beauty products that have sent me on the edges of insomnia. 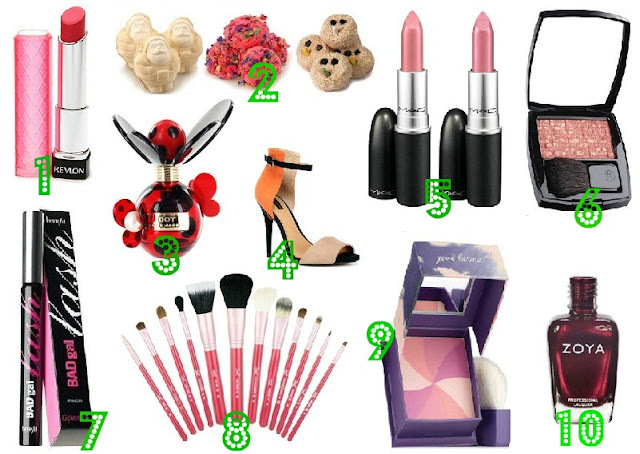 If you think there are only these ten, then you don't know the obsessions of a beauty blogger. I have battled hard to finally dig 10 names from my head. A mighty task, I tell you! 1. REVLON COLORBURST LIP BUTTERS - The more I see people wearing them, the more I fall in love. Peach Parfait and Candy Apple are my favourite shades right now. 2. LUSH SOAPS - I am a sucker for cute things. And when it comes to LUSH they are so many crazy-cute handmade soaps to choose from. 3. MARC JACOBS DOT - Ah! Isn't that red ladybird inspired bottle to die for? Since the day I read about it on Indian Vanity Case I can't wait for it to come out in July. 4.HEELS by ZARA - Of course I am a heel fanatic and for me nobody makes them like ZARA (or Aldo)! 5. MAC LIPSTICK - Is it a crime to be a beauty blogger and yet never been able to try out anything MAC? I hope not. But I plan to change it soon by starting with owning at least ONE MAC lipstick. 6. CHANEL TWEED BRUN ROSE LES TISSAGES DE CHANEL - What a freakishly long name! And I was lost in this longness the minute I set eyes. To top it off, it was in Temptalia's five picks of Coral-Orange Blushes. 7. BENEFIT COSMETICS BAD GIRL MASCARA - The perfect thing for my teeny lashes, this mascara is true to its name or that's what I have heard. 8. SIGMA MAKE ME UP KIT - I know there are so many better brushes but I still can't get this kit out of my head since last year. I so want it! 9. BENEFIT COSMETICS HERVANA BOX O'POWDER - Have heard SO MUCH about these boxed powders. And out of all those Sugarbomb, Coralista or Hervana have been my picks. When the times comes to strike this off my wishlist, I'd probably choose Hervana. 10. ZOYA NAILPOLISH BLAIR - Do you see that gorgeous shimmering burgundy? It's too breathtaking to not to add in my wishlist.